We’ll be having one combined worship service on April 22 at 11:00AM in the Main Sanctuary when our youth come to bring the worship and the message for Discovery Sunday, but they aren’t the only ones with a story to tell! 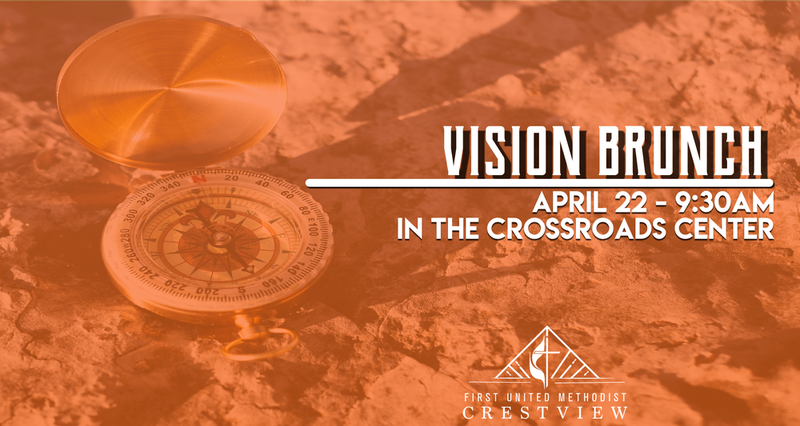 Come join us that same morning for our Vision Brunch from 9:30AM-10:45AM in the Crossroads Center as we hear testimonies about what God has done in the last year, and what God will do through us in the year ahead. Our Finance Committee will also present a draft of our budget for the coming year, and you can pick up your covenant card as we get ready to renew our “One Faithful Promise” together. *Nursery/Childcare 6weeks-5th grade is available from 9:15-10:45AM for the Vision Brunch. Combined service nursery is available for 6 weeks-age 3 at 10:45AM. Children ages 4 and up are invited to attend service with their families.